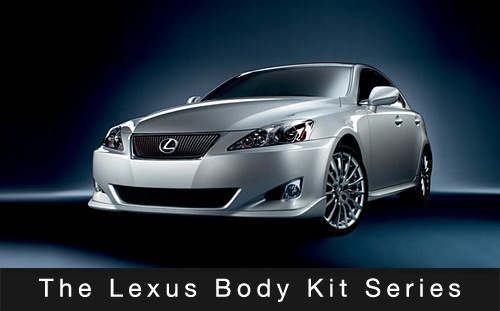 For the fourth part of my Lexus Body Kit Series, I bring you the IS 250/350/220d. I was surprised to find that the IS 250/350/220d had less body kits available than the third-gen GS, as I was expecting far, far more. Thinking on it, I figure it must have something to do with the great job Lexus did designing this car in the first place. Most of the IS kits have a real “bolt-on” look, making the aftermarket parts seem really obvious, which isn’t very appealing to me. There are exceptions though, as both the Tom’s IS45 and Carlsson IS look like natural extensions of the body. However, none match the Lexus OEM ground effects kit, pictured above, for shear subtlety, though that can hardly be consider a shock. Now those are some serious looking side vents!